Italian chef Nick Stellino started his culinary career washing dishes. He's now a popular cookbook author and has his own series on public television, "Nick Stellino's Family Kitchen," now in its 10th year. 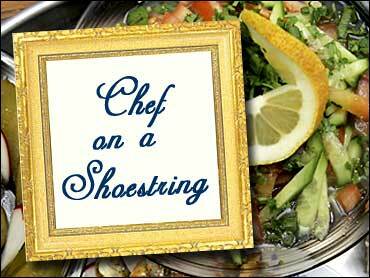 Stellino's specialty is using affordable ingredients for delicious meals, and he brings that approach to The Saturday Early Show's Chef on a Shoestring, preparing a three-course meal for four on our budget of $40. On the menu, a Mediterranean salad with avocado, oranges, onion and fennel; pasta with prosciutto and parmesan cheese sauce; and chocolate zabaglione with blueberries. Fennel: The bulbous base and the stems of fennel can be eaten raw or cooked. When buying fennel, look for clean, crisp bulbs with no sign of browning. Prosciutto: There are many different kinds, at many different prices. In general, the word prosciutto is Italian for "ham" and is used to broadly describe a ham that's been seasoned, salt-cured and air-dried. The meat is then pressed, which produces a firm, dense texture. Zabaglione: This dessert is basically an Italian custard. It's made by whisking together egg yolks, wine (such as sweet Marsala) and sugar. It's done over simmering water so the eggs cook as they thicken. Traditional zabaglione is made right before eating so it's served warm. It can be served alone or over cake or fruit. Chef Stellino is adding chocolate to his zabaglione. 1) Make the dressing by whisking the mayonnaise, salt, pepper, orange juice and vinegar in a bowl. Continue whisking vigorously and slowly add, in a stream, the olive oil. Continue whisking until all the ingredients are incorporated and the olive oil is emulsified into the salad dressing. 1) Peel the oranges or nectarines, cut in half, then cut across in half-moon shapes. 2) Toss the lettuce, onion, fennel, orange pieces, avocados and optional croutons. 3) Add the dressing, mixing well to coat all the ingredients. Place the salad on individual serving dishes and sprinkle with cheese. 1) Cook the pasta according to the package directions and set aside. 2) Melt the butter and olive oil in a large sauté pan over medium heat until bubbling. Sauté the onion, ham, garlic and the red pepper flakes until the onions are tender and the ham begins to brown, 6 to 8 minutes. 3) Deglaze with the wine, stirring to dislodge any flavorful brown bits at the bottom of the pan. Reduce the wine by half. 4) Stir in the chicken stock and cream salt and pepper. Bring the sauce to a boil and simmer to a sauce consistency, 10 to 12 minutes. 5) Melt the Parmesan cheese into the sauce. Stir the optional peas. Cook three more minutes. 6) Add the pasta and stir into the sauce for 3-4 minutes over medium heat. 7) Serve the pasta and top with additional parmesan cheese. 1) In a small saucepan, melt the cream and chocolate over low heat. Set aside and keep warm. 2) In a double boiler, whip the egg yolks and sugar to a creamy consistency beating well with a whisk for 4-5 minutes. Be careful not to overcook the egg mixture or you will make sweet scrambled eggs. 3) Remove from the heat and add the remaining Marsala wine. 4) Bring the pan back over the heat and continue to whisk until the egg mixture almost doubles in size, 3-5 minutes. Take the pan off the heat. Add the melted chocolate cream to the egg mixture and continue to whip it with the whisk. 5) Divide the blueberries among 6 to 8 serving bowls. Top with the chocolate zabaglione, and decorate with optional whipped cream and grated chocolate, or chocolate jimmies.